1. The house that Arrow built. 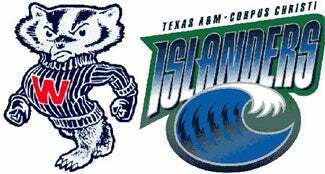 TAMUCC has only been part of the Texas A&M system since 1989. In 1998, they hired South Alabama coach Ronnie Arrow to create a Division-I basketball program out of thin air. He did just that, cobbling together a pair of respectable .500 seasons before earning Independent coach of the year honors three times. This year, the Islanders made their debut in the Southland Conference and compiled a 25-6 overall record. Someone ought to name a building after that guy. 2. Who invited these bastards? Northwestern State University upset No. 3 seed Iowa in the Big Dance in 2006. No doubt they and other Southland conference members were wolf-whistling like inmates at Oz catching sight of fresh meat when TAMUCC appeared on their schedule for the first time this year. Fast-forward to March, and the new guys have a dominant 13-1 record in the conference and have grabbed the auto-bid. Fellas, I think you've been hustled.